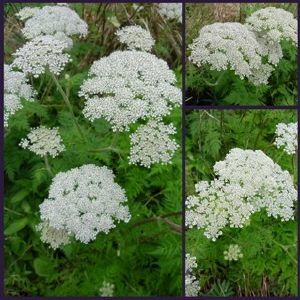 Selinum carvifolia is an outstanding architectural plant with large, flat, dense, creamy umbels, stacked one upon another, over very, very finely divided, sage green parsley-like leaves. it spreads out its basal leaves to form mats of this fine foliage. Each leaf is intricately divided. Strong ribbed stems then start to push up, heavily endowed with more fretted leaves, making tiered layers of lace. Each flower head becomes a plateau composed of a number of smaller florets, which in turn are made up of a myriad of tiny flowers. The flower heads are perfect circles composed of smaller circles. Selinum carvifolium has a reputation for reliability and longevity. Selinum carvifolium looks great planted amongst ornamental grasses, planted in more ‘wild’ effect gardens, or just to bring some class to the Herbaceous Border. Another great plant to attract bees and butterflies into the garden and if content will naturalise moderately. The flowers are a magnet for bees and are deliciously scented. Selinum carvifolia prefers a south, east or west facing aspect, exposed or sheltered. Grow in moderately fertile, moist but well-drained soil in full sun or partial shade. Soil can be acid, alkaline or neutral, sand, loam, chalk or clay. In our gardens it relishes good deep soil and, when treated well, will reach 120cm in height and half as much across. It thrives in light stony soil, but in seems equally happy on heavy clay. It appreciates a humus-rich mulch of home-made compost but needs no other attention. Staking is unnecessary even in an exposed site. Uses: Selinum carvifolium looks great planted amongst ornamental grasses, planted in more ‘wild’ effect gardens, or just to bring some class to the Herbaceous Border. Another great plant to attract bees and butterflies into the garden and if content will naturalise moderately.